Home loan is important source of finance for buying a home. It is important to ensure that your home loan is affordable for you and you are comfortable to repay them. Loans are provided based on the market value, mainly estimation given by banks on the registration value of the property. Home Loan is a Secured Loan offered against the security of a property which is funded by the banks.Banks funds loan for both Residential as well Commercial property. Home Loan is especially for individuals who are looking to purchase for new flat or apartment, resale flat or old flat.Nowadays bank is also offering loan on new under construction flats. Major Home Loan Provider : SBI Home Loan, ICICI Home Loan , HDFC Home Loan, Axis Bank Loan, IDBI Home Loan, Bank Of India , LIC Housing Finance , Tata Capital Housing Loan , Reliance Home Loan, India Bulls Home Loan etc. All banks have different interest rate and updates regularly so before going to any bank kindly check for interest available in that particular bank. You can also compare interest rates for different banks.All banks have floating and fixed interest rate you can choose any one. Note : Some banks offer 80% , 85% or 90% of loan on property value (registered property value). Here below you can find a Calculator called Home Loan EMI Calculator (Equated Monthly Installment).You can add your Loan Amount that you are looking for and time period (15years , 20 years or 25 years) and at what interest rate that you are looking for lets say (9.50%,10.50%,11.25,%12.50%).Once you add all the details just click on the calculate button the Monthly Installment value will be displayed below. Enter values and click on the Calculate button to get the EMI. The amount of home loan you are eligible for depends on your occupation (whether you are salaried/ self-employed), your income, the interest rate charged by the bank and the tenure of the loan. As you will discover, the interest rate on the loan not only influences how much EMI you will pay each month but also influences the loan amount you are eligible for. If your are earning 10,000/- per month then assume that a bank interest rate (9%) then as per government rules 40% will be calculated from your salary means as per this example your eligibility will be 4000/- from your current salary so now next step to divide interest rate. At an interest rate of 9%, the monthly installment of an Rs 1 lakh, 20-year loan is Rs 900. The maximum loan to value ratio is typically maintained by most banks at about 75% to 85% (where the value is the property value + stamp duty + registration). NOTE : * These amounts are indicative only. 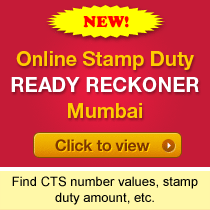 StampdutyRegistration.com disclaims any responsibility for any decision taken based on these calculations.